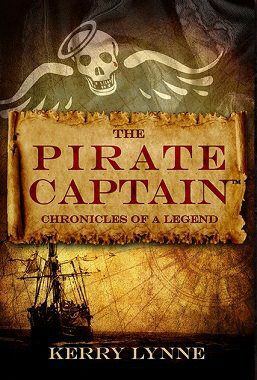 Today I am posting an author interview that I did with Kerry Lynne, the author of The Pirate Captain. I hope you all fall in love with her and her book as much as I did!! How would you describe The Pirate Captain to someone who has yet to read it? As a pirate novel, The Pirate Captain is unlike anything they might have read. It’s not a romance novel, although it does have a powerful romantic thread. (One woman on a ship with two hundred men; how could you not?) Neither is it a Treasure Island wannabe, although it does have a good deal of adventure and action. You might describe it as Pirates of the Caribbean meets Master and Commander and not an “argh! !” is uttered. It’s the story of scarred and damaged people (both physically and mentally) and how they manage to get through life. It’s the story of trust, or rather, the lack of, in both other people and that Providence will ever smile again. The nautical aspect was my greatest worry. If you’re dealing with pirates, you have to have ships and sailing, but that can be overwhelming, and hence scary, to the landlubber. I wanted this book to be a stepping stone into that world, a little finger crooking, saying “Com’mon, it’s safe. You can do it.” In that spirit, I made a special effort to keep the “nauticalese” to a minimum and introduced it slowly, allowing the reader to learn as he/she reads along. Luckily Cate Mackenzie, the heroine through whose eyes most of this is seen, isn’t a very good sailor. There’s a glossary pdf available at our website www.piratecaptain.net (where there are several excerpts as well), which is included at the end of the e-book version. In the meantime, I know the purists would crucify me, because it’s not 100% accurate. Which part of writing/researching The Pirate Captain was the most personally interesting to you? There are relatively few first hand records of pirates from anyone other than magistrates, enraged citizens or captives (none being what you could call impartial.) A vast number of pirates couldn’t write. Many of the ship’s logs (their daily diary, if you will) were destroyed when they were captured, lest they be incriminated by their own hand. Some people have referred to the pirates as an 18th Century version of Hell’s Angels, pillaging and terrifying towns. Others have compared them to rock stars, because in many places they were wildly popular (pockets full of money can make anyone popular). I tried to see them as all that, but also as people, with all the same needs and goals as anyone else. The other fascination in research was learning how much of our modern daily language comes from the Golden Age of Sailing. Scuttlebutt, bitter end, toe the line, slush fund, three squares a day, worth his salt, between the Devil and the deep were all from back then. There are scads more. The language of those mariners is still with us. A historical fiction writer’s greatest challenge is gleaning the modern sound from your prose and finding the period voice. My greatest treasure is a set of Patrick O’Brian audiobooks a friend of mine gave me for Christmas. It helped with the period, the British accent and the nauticalese. Reading and listening are far different things; each employs different parts of the brain. My advice to anyone writing historical fiction is to find something of this nature that relates to the period in which you are writing and listen, long and hard, perhaps daily as you drive. It will get your ear trained, and help you “hear” your descriptive and character voices. What are you reading right now? Are there any authors (living or dead) that you would name as influences? Gone with the Wind was probably my coming of age book. It introduced me to historical fiction. Gabaldon’s Outlander came at just the right time, and led to a very long sequence of events. The theme to The Pirate Captain is a little different. In most books, the plot revolves around the hero or heroine striving to achieve something, their prize. In The Pirate Captain, Cate (and Nathan Blackthorne, the hero, for that matter) gain what their prize straightaway. The story hinges on what lengths a person is willing to go to in order to keep what they want. My main goal was to create a world and characters into which the reader could escape. My dream was to be told “I couldn’t put it down” or “I didn’t want to stop reading.” It’s happened a couple times, but I don’t think a writer could ever hear that too much. What inspired you to write your first book? Like so many, being one with a vivid imagination, I did a lot of writing in high school, some of it what we would call fan-fiction today. My Creative Writing teacher had suggested I try to publish some short stories and novellas. In college, a couple history professors urged that I should try to publish some of my papers. Life got in my way after that. Then came the day that every time I walked through the living room my husband was watching Pirates of the Caribbean on TV. One of the movie channels was running it seemingly day and night. He kept insisting that I should sit down and watch it, so being the dutiful wife, I did. I hooted and jeered, pointing out all the inaccuracies and unlikelihood’s, but my husband just kept saying “Don’t over-think it. Don’t over-think it.” So I did. I’m not quite sure what happened, but the imagination was triggered once more. I got involved with some online writing groups. I discovered that there was a whole world of people like me, who had stories constantly buzzing around in their heads. I think fan-fiction is a great venue to practice and hone your skills, because you already have an eager audience with common interests, everyone learning to write together. Eventually, however, I found the canon characters were too limiting. I wanted to stretch out and explore, so enter Cate Mackenzie and Nathanael Blackthorne, two very flawed people. It’s natural that Nathan, my pirate captain, will be compared to Pirates of the Caribbean’s Jack Sparrow. Who the heck else is there in nearly sixty years? They are both pirates, both captains, both loveable jerks, but I’d like to think Nathan sets himself apart in a number of ways. Hopefully, the reader will see the differences and agree. What genre do you consider your book(s)? Umm… definitely historical fiction. There is a romance, but it’s most definitely not that genre. There is action and adventure, which keeps the male reader engaged. The sailor’s life at that time was rife with superstition, so there is a certain amount of the mystical, as well. When a cannonball misses a person, is it because he’s charmed or just lucky? When a wave almost washes someone overboard, is it because a sea goddess was trying to take him or did another god intervene? Do you ever experience writer’s block? Oh, dear. It’s like asking if I ever experienced sadness or hunger. Of course! It’s all part of the creative process. I worked in the art field for over 30 years. During that, I learned you can train the brain. Sit in the same room, in the same chair, at the same time of day, with the same music playing… whatever, and you can condition the brain to engage and produce. As I mentioned earlier, I don’t work from beginning to end. I patchwork my way through. It’s great, because whatever pops into my head that day I go with it, and then worry about where it will fit into the grand scheme of the story later. Often it’s a line of dialogue (Nathan constantly chatters away in my head) or a bit of description, and I go with it from there. Do you write an outline before every book you write? Egads. Just the thought gives me writer’s block. I have a general idea of where I’m going and how I’m going to get there. In the process, however, the characters often take over, taking me on their own journey. Writing a novel is often more a matter of providing the stepping stones of getting from Point A to Point Z. I often think in terms of “Well, if I want this to happen, then this has to happen first, if it’s to make any sense. But in order for that to happen, I need this, this and this.” I often build characters backwards from what I need them to, but then every layer you add to a character leads to more complexities. While you were writing, did you ever feel as if you were one of the characters? Not necessarily become one of the characters (a bit of self-insertion is inevitable), but I do strive to be in their world, feel, see, smell, hear and so on. I really feel a writer who struggles to come up with characterizations in a scene or dialogue isn’t really in connection with that character or the world they are in. The more real the characters are to the writer, the more real they are going to be for the reader… and isn’t that the whole point? Cate Mackenzie and Nathan Blackthorne have been with me for over six years. They have become dear friends, but they still surprise me, especially Nathan. I never know what is going to fall out of his mouth. I can’t imagine leaving them, so I have plans for several sequels. Give us three “Good to Know” facts about you. Be creative. Tell us about your first job, the inspiration for your writing, any fun details that would enliven your page. I have a painted Christmas ornament in the Smithsonian. President Clinton took three additional ornaments I had painted to the Middle East Peace Talks. My first time ever sailing was in a 22-foot boat on Lake Superior, 50 miles across to Isle Royale. Talking about myself is neither comfortable or interesting. I was a history major in college and went into teaching. That didn’t work, so I had two office careers. Through a circuitous sequence of events, I wound up in the decorative painting world, where I travel taught and published for some 30 years. And then my hand wouldn’t work. So I went back to what I knew: writing, history and sailing. It remains to be seen if that is working. Kerry and her book can be found at her website: http://www.piratecaptain.net and/or on Facebook under “Pirate Captain”. Posted on February 7, 2013 by FRaPS: Family, Relationships and Personal Situation. This entry was posted in Author Interviews and tagged author, author interview, aviation, book, chronicle, current-events, gaming, Kerry Lynne, literature, pirate captain, publish, review, The Pirate Captain, transportation, videogames, write, writer, writing. Bookmark the permalink.